Background: Hydrophilic Interaction Liquid Chromatography (HILIC) orthogonal to conventional reversed phase High-Performance Liquid Chromatography (HPLC) mode allowing separation of polar compounds. HILIC has been reported to be an alternative to normal phase liquid chromatography, yet the separation mechanism reported in HILIC is much more complicated than that in normal phase liquid chromatography. Objective: To investigate the effect of water layer thickness on silica gel and the amount of ammonium ions present within the buffer on retention mechanism in hydrophilic interaction chromatography. Methodology: A test system was designed which used weak acids, neutrals and weak bases as probes with three different strengths (5, 10 and 20 mM) of ammonium acetate, ammonium formate and ammonium propionate as the counter-ions to compete with the test probes with ionised silanol groups and water present in the stationary phase. 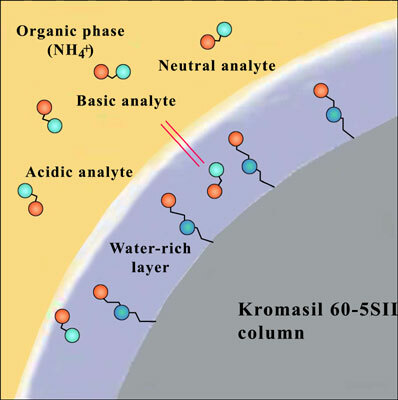 A Kromasil 60-5SIL column (150 mm×4.6 mm×4 μm, pore size 60Å) was used as the stationary phase to perform the study. Results: Retention times were examined for the test probes at 90% acetonitrile (ACN) with 10% of 5, 10 and 20 mM of ammonium acetate, ammonium formate and ammonium propionate. As the buffer strength increases, the thickness of the water layer on the surface of the silica gel increases and also the repulsion between ionized silanol groups and acidic test probes will decrease. On the other hand, such increase in buffer strength will increase the competition between the ammonium ions and basic test probes. In addition, the hydration energy of buffer’s counter ions and hydrophilicity may be important in retention mechanism in HILIC mode. Conclusion: At 20 mM buffer strength acidic probes with low log P values retain more due to reduced repulsion by silanol groups, while basic probes retention time will decrease due to increased competition from ammonium counter ions. However, in 5 mM buffer strength basic probes with low logP value will be retained longer, while acidic probes will be eluted earlier due to the repulsion between ionized acids and ionized silanol groups. Buffer strength, counter-ion, HILIC, kormasil column, retention mechanism, silica gel, water solubility.